Ahaziah Typifying Pride, Workshop of Master Honore, c. 1290. Web Gallery of Art. Elijah on the Fire-Cart, Giotto di Bondone, 1304-06. Web Gallery of Art. The Prophet Elijah and the Fiery Chariot, Unknown Russian, 14th Century. Olga's Gallery. Prophet Elijah in the Desert, Dieric Bouts the Elder, 1464-68. Web Gallery of Art. Elijah and the Widow of Zarapeth, Unknown Flemish, 1500-20. Web Gallery of Art. Elijah Fed by the Raven, Giovanni Girolamo Savoldo, c 1510. National Gallery of Art. Elijah Begging for Fire from Heaven, Gerard Horenbout, 1510-20. The Getty Museum. Scenes from the Life of the Prophet Elijah, Jorg Ratgeb, 1517. Web Gallery of Art. Elijah Raising the Son of the Widow of Zarephath, Simon Bening, 1525-30. The Getty Museum. Elijah and the Widow of Zarephath, Hans Snellinck, 1578. National Gallery of Canada. Beaker (with Elijah in the Desert), 1599. Getty Musum. Elijah's Ascent into Heaven - Icon, 16th century. Russian Icons. The Prophet Elijah, Marc Arcis17th century. Musee des Augustins, Toulouse. Landscape with Elijah Mocked, David Vinckboons, c 1610. National Gallery of Art. Landscape with the Prophet Elijah in the Desert, Abraham Bloemaert, 1610's. State Hermitage Museum. Landscape with Elijah and the Angel, Gaspard Dughet, 1615-1675. National Gallery, London. Elijah Fed by Ravens, Guercino, 1620. National Gallery, London. Elijah Receiving Bread from the Widow Zarephath, Giovanni Lanfranco, 1621. Getty Museum. 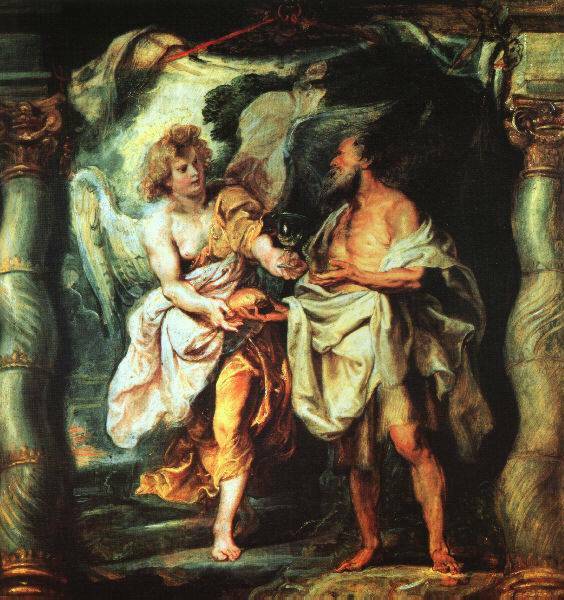 The Prophet Elijah Receiving Bread and Water from an Angel, Peter Paul Rubens, c. 1625. The Prophet Elijah by the Brook of Kerith, Rembrandt, c. 1655. Biblical Art on the WWW. Landscape with Elijah and the Angel, Gaspard Dughet, c. 1660. National Gallery, London. Elijah and the Angel, Sir Godfrey Kneller, 1672. Tate Gallery. Elijah Taken Up In a Chariot of Fire, Giuseppe Angeli, c. 1740-55. National Gallery of Art. Elijah and the Angel, George Richmond, 1824/25. Tate Gallery. Elias is Taken Up to Heaven in a Fiery Chariot, Gustave Doré, 1866. Elijah Ascends in a Chariot of Fire, James Tissot, 1896-1900. Christian Theological Seminary, Indianapolis. ELIJAH FED BY RAVENS, Unidentified early 20th century. Search at Smithsonian American Art Museum. Elijah and the Chariot of Fire, snow sculpture by Allen Jay Haroldsen, 1988. Elijah, Phillip Ratner, 1998. Dennis and Phillip Ratner Museum. Saint Elias, Contemporary Icon at Byzantines.Net. Elijah the Prophet - Icon. Russian Icons. Elijah the Prophet in the Desert - Icon. Russian Icons. Elijah and the Prophets of Baal, Bogota Columbia, Contemporary. Elijah Taken Up in a Chariot of Fire, Giuseppe Angeli, National Gallery of Art. Elijah Taken Up to Heaven, He Qi, China. Elijah and the Ravens, He Qi, China. Sleeping Elijah, He Qi, China. Elijah, stained glass at Christ Church, Pompton Lakes, New Jersey. Elijah the Tishbite, Diane Shimon, Children's Illustrated Bible. Elijah with Chariot of Fire, stained glass at Sacred Heart, Jersey City. stainedglassphotography.com.